Last year marked our first Mother’s Day back in California, so we invited my mom and brother up from San Diego for a Mother’s Day brunch that ended up being so much fun that we decided we need to make it an annual tradition. This year when I asked my mom for any special requests for our brunch she asked for the food to comply with the #Whole30 guidelines, as (unbeknownst to me) she was currently attempting the Whole30 program. I’ve completed Whole30 myself a couple of years ago, and these days I don’t eat gluten and I limit my sugar and dairy intake (which may come as a surprise to those reading this who don’t personally know me), so I’m very familiar with the guidelines. However, I do eat some sugar and in terms of cooking up a brunch for four that was Whole30 compliant, I felt a little challenged. I’m a pro-brunch hostess and have a few excellent go-tos, but they definitely aren’t gluten/soy/dairy/sugar free! Because the idea of a super healthy brunch seemed too tricky for me to execute, I just pushed the timing back an hour and called it a lunch. 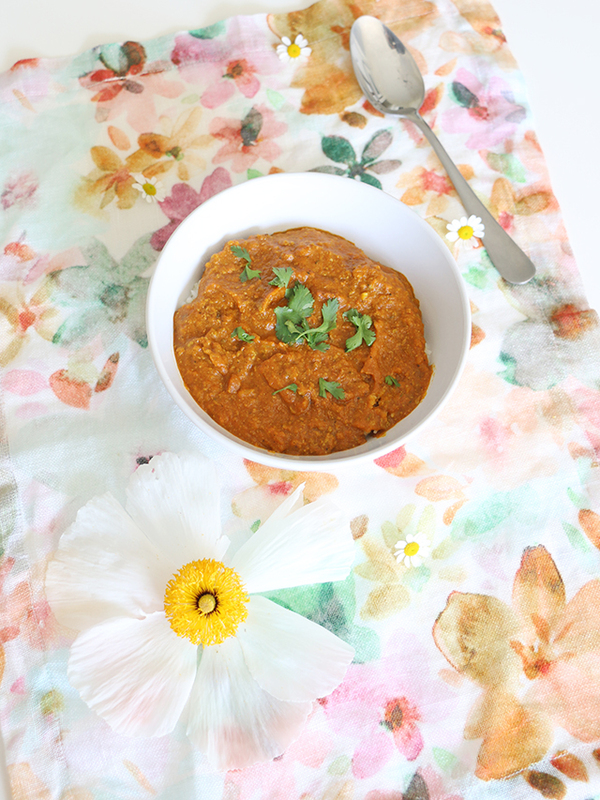 Since I post so many sugar-centric recipes on here, I thought I might as well mix it up and share what I made for our Whole 30 Mother’s Day lunch, since this is actually a much more realistic look at how I eat on the daily. 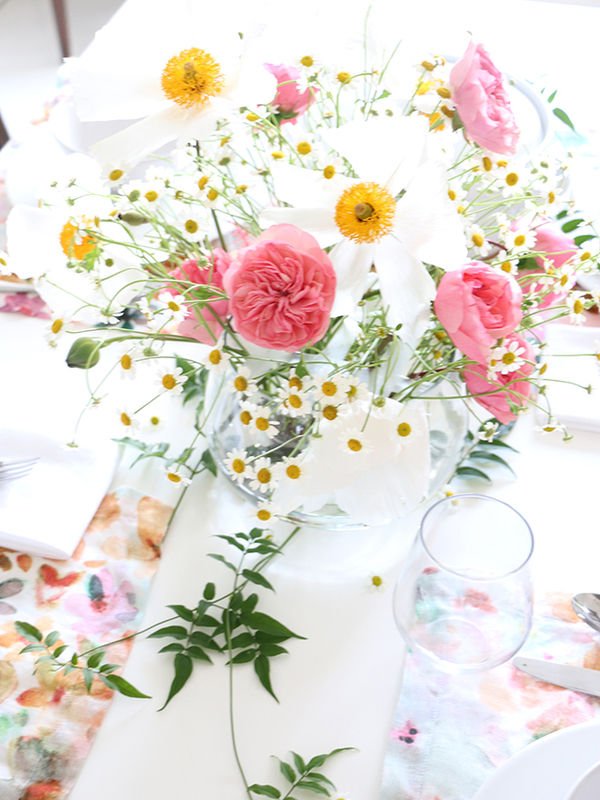 Continue on for the menu, as well as a little look at the table setup and a flower arrangement that I whipped up the morning-of that cost just $10 to make! The Menu: For our lunch, I served a curry with meatballs that was Whole 30 compliant along with rice (for the rest of us), as well as my two most favorite salads – a melon salad and a spinach salad. 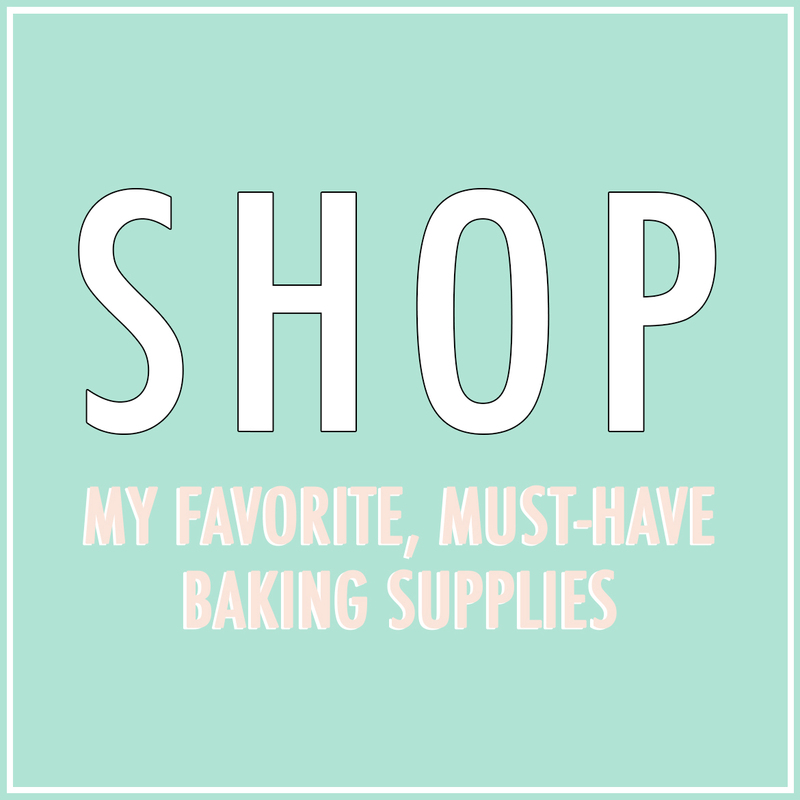 All of those recipes are included below! 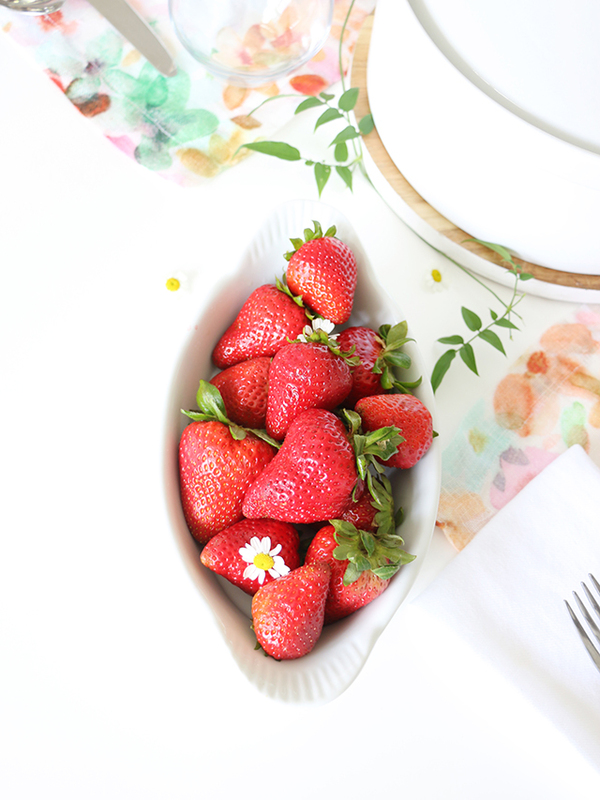 For dessert, I had fresh organic strawberries, as well as some dried mango on hand. Of course fruit has sugar in it, but they do allow it in the Whole 30 program. If you’re attempting the program, I highly suggest you purchase some organic dried mango – that was my favorite go-to when I was craving something sweet during my Whole 30 adventure! 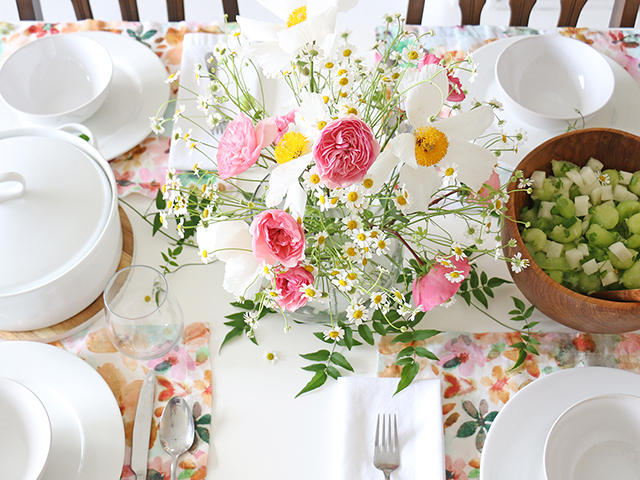 The Table: I didn’t want to go too crazy on the table, I just wanted the setting to be simple and beautiful. 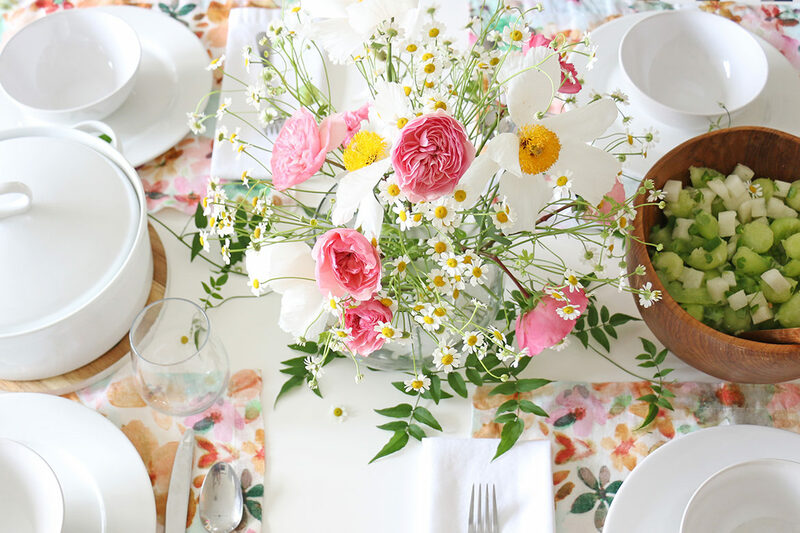 I set the table with beautiful floral placemats from Crate&Barrel (available HERE), along with white plates, bowls, and linens. 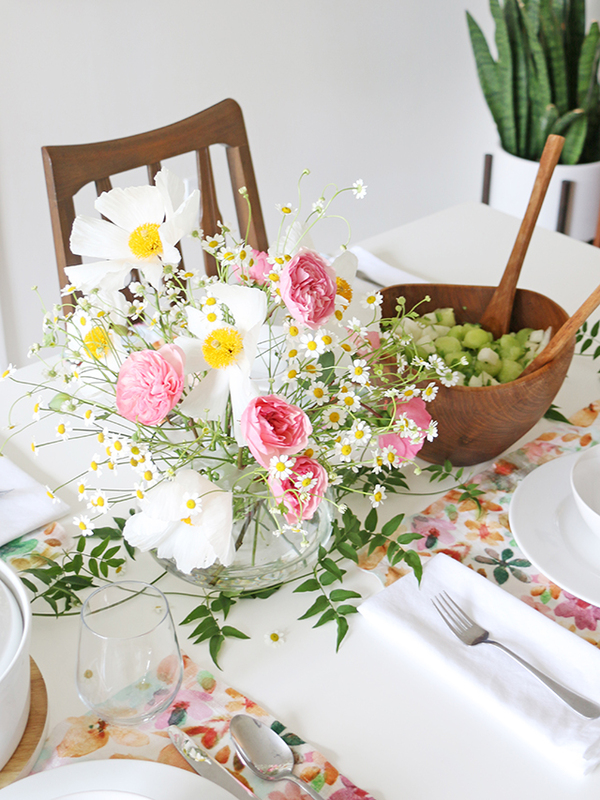 I made the flower arrangement the centerpiece of the table, and then added some jasmine vines that I had pulled from my side yard. I used a beautiful vintage monkey pod wood bowl for the melon salad and a vintage teal ceramic bowl for the spinach salad. The curry meatball dish was served in my favorite white porcelain casserole dish (available HERE). 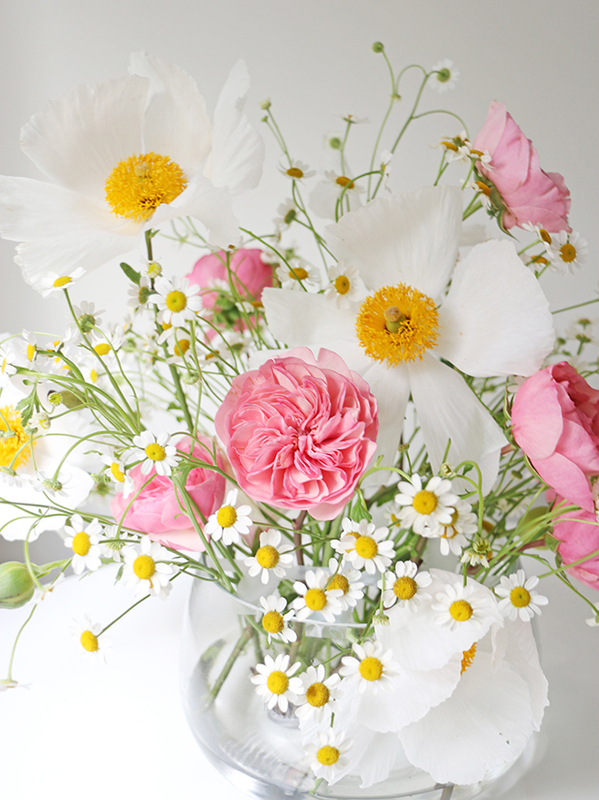 The Arrangement: On Mother’s Day morning, I realized I had forgotten to buy flowers (oops!) so I ran over to Trader Joe’s and picked up a bundle of chamomile flowers and a bundle of pink garden roses for a grand total of $10. 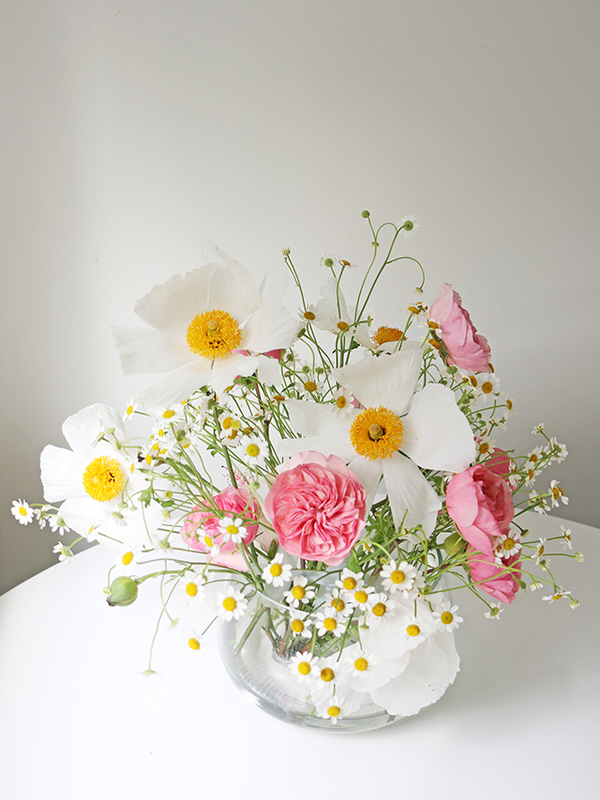 Once I was back home I cut a few of the matilija poppies I have growing in my front yard, and got to work arranging the flowers in my favorite terrarium bowl (look familiar? ha). I am definitely not a florist, but I happened to have a tiny floral frog that I positioned into the bowl and I made a grid across the top of the bowl using 6 strands of scotch tape – both the frog and the tape allowed me to get some of the larger flowers to stand up in the rounded bowl, which was very helpful since I have ZERO flower arranging skills. You can see the tape and frog in the below photos. 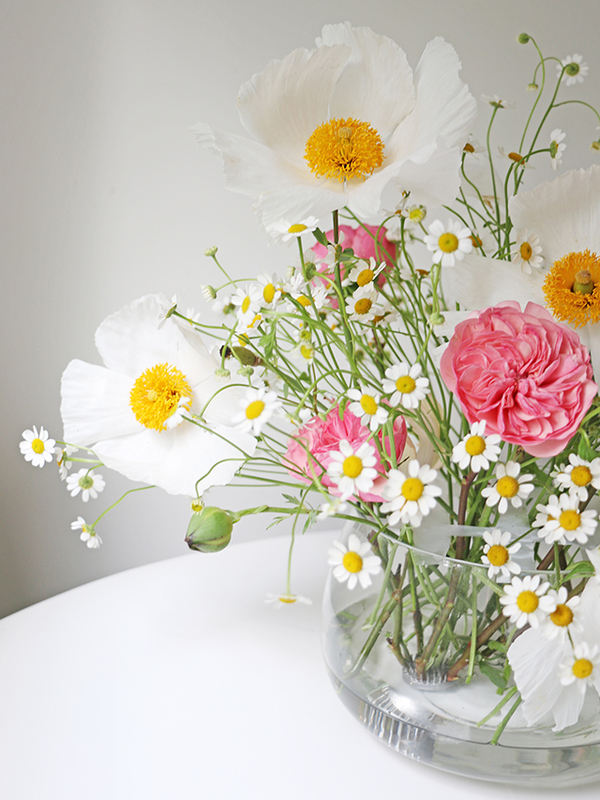 I went a little crazy with the chamomile filler because I was really digging the 60’s vibe of it AND it helped my other flowers keep their position in the bowl. For spending $10 and only having 30 minutes, I was pretty proud of myself! The Recipes: Below you can find the recipes for the curried meatballs, melon salad, and spinach salad. Instead of adding the organic indication in each ingredient, I thought I’d just mention it up here and advise my personal preference of ALWAYS choosing organic when you have the option. Since this isn’t a health food blog, I won’t go into detail, but I’ve personally done a lot of research for my own food choices and I couldn’t be more passionate about choosing organic, ESPECIALLY when it comes to fruit and vegetables. Important sidenote: We now live in a country where our president doesn’t care about proper food regulation, so it’s more important than ever to make sure you are looking into where all of your food comes from. There is a great mobile app called “Buycott” that allows you to scan every item in a grocery store by simply just holding up the product to your phone. It provides a full rundown of the ingredients, any dangerous ingredients or affiliations it has, and all of the company info for each product. You can also choose campaigns you support (i.e. Say NO to Monsanto, End Animal Testing, NO to palm oil products, etc.) and it will alert you if any of the products you scan have a conflict. I highly recommend downloading the Buycott app! Okay, with that said, on to the recipes!! Curried Meatballs – This recipe is from Bon Appétit. I made a few modifications to comply with Whole 30 and/or as a personal preference, which are noted in bold. Preheat oven to 400°. Lightly brush a rimmed baking sheet with oil. Purée scallions, jalapeños, garlic, ginger, lemon juice, curry seasoning, coriander, cumin, and cayenne in a blender until smooth. Transfer mixture to a large bowl and add beef, egg, coconut yogurt, and salt. Mix with your hands to combine all ingredients. Roll beef mixture into golf ball–size portions and place on baking sheet, spacing 1″ apart (you should have about 24). Drizzle meatballs with more oil and bake until browned on top and cooked through, 20–25 minutes. Tip: After baking the meatballs, let them cool for a few minutes and then use a spatula to remove each meatball from the pan and set aside on a plate (if you leave them on the pan while you’re cooking the curry, the meatballs may stick to the pan after they cool which can make them break apart as you try to remove them). Heat oil in a large Dutch oven or other heavy pot over medium. Add onions, garlic, and ginger and cook, stirring often, until onions are translucent and starting to brown, 8–10 minutes. Stir in curry seasoning, cumin, turmeric, coriander, and peppercorns. Cook, stirring often, until mixture is very fragrant and spices begin to stick to the pot, about 2 minutes. Add tomatoes, stirring and scraping bottom of pot, and bring to a boil. Add 1 Tbsp. salt and 2 cups water; return to a boil. Reduce heat and simmer until flavors have melded, 25–30 minutes. Let curry sauce cool slightly, then transfer to a blender; blend until smooth. Wipe out any bits remaining in pot and transfer curry sauce back to pot. Stir in lemon juice and cayenne; taste sauce and season with more salt if needed. Gently nestle cooked meatballs into sauce, bring to a simmer, and cook until meatballs are heated all the way through, 10–15 minutes. If you’re not on the Whole 30 program, serve atop a bed of organic Basmati or Jade Rice. Finish off with a sprinkle of fresh cilantro. 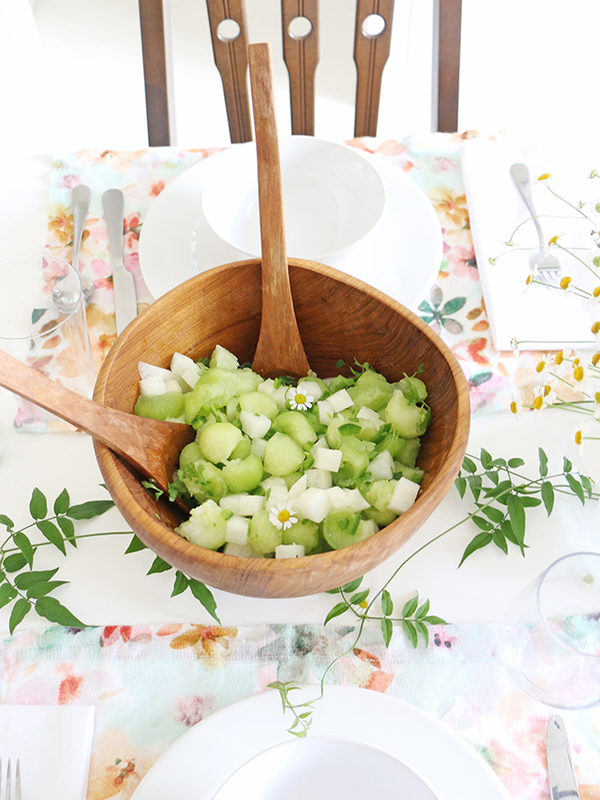 Melon Salad – This salad is so easy and SO darn good! It is a perfect combination of textures and sweet/salty flavors…it is the perfect late spring/early summer salad recipe you didn’t even know you needed. Enjoy! 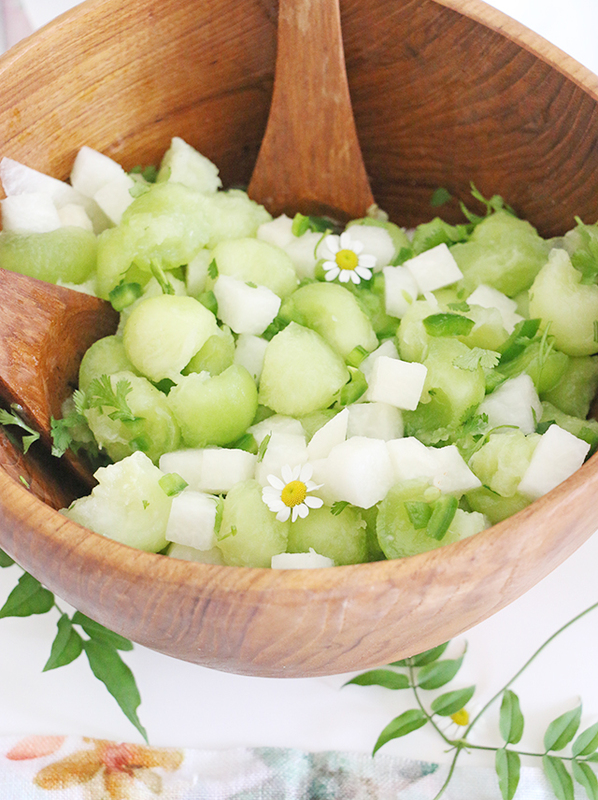 Use a melon baller to scoop the honeydew melon into a bowl. Peel and slice the jicama root into small (under 1-inch) cubes and add to melon. After removing the seeds, chop the jalapeños into small pieces and add to the bowl. Chop the cilantro leaves and add to the bowl. Add the juice of 2 limes, as well as a dash of sea salt, and mix until combine. Let the salad sit for at least 1 hour before re-mixing and serving to allow the juices and flavors to thoroughly mix together. Spinach Salad – I make this salad nearly EVERY SINGLE DAY for lunch – it’s healthy, detoxifying, and absolutely delicious! It’s also the reason I’ve become obsessed with sauerkraut recently – any leafy salad just isn’t the same without it! 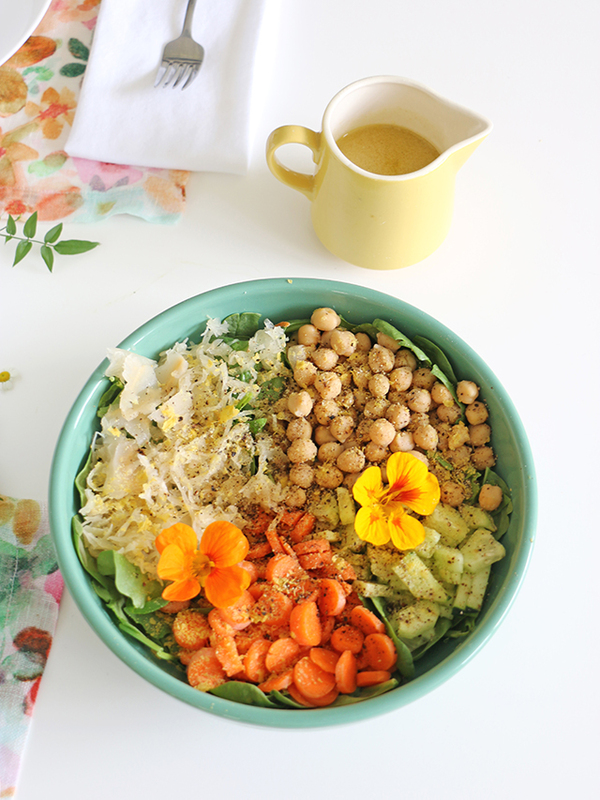 Add all of the salad ingredients into your bowl. 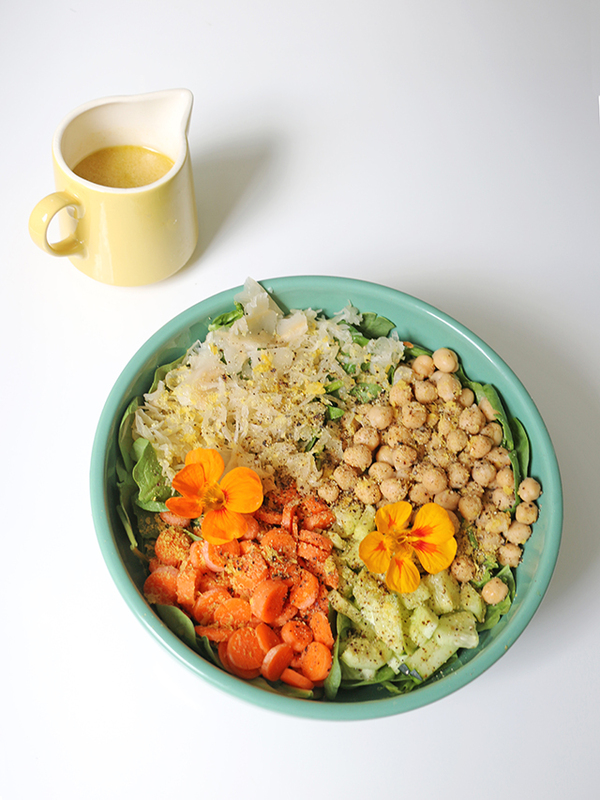 For the dressing, whisk together the dijon mustard, olive oil, and apple cider vinegar and pour over the salad. Mix to combine before serving.